An in-game screenshot of Legend of Grimrock, a real-time, first person view, tile-based dungeon crawler in the style of Dungeon Master. Barton, Matt (February 23, 2007). "The History of Computer Role-Playing Games Part 1: The Early Years (1980–1983)". Gamasutra. UBM TechWeb. Retrieved September 5, 2010. Barton, Matt (February 23, 2007). "The History of Computer Role-Playing Games Part 2: The Golden Age (1985–1993)". Gamasutra. UBM TechWeb. Retrieved September 12, 2010. Barton, Matt (April 11, 2007). "The History of Computer Role-Playing Games Part III: The Platinum and Modern Ages (1994–2004)". Gamasutra. UBM TechWeb. Retrieved September 5, 2010. Barton, Matt (2008). Dungeons & Desktops: The History of Computer Role-Playing Games. A K Peters, Ltd. ISBN 1-56881-411-9. Retrieved September 8, 2010. King, Brad; Borland, John M. (2003). Dungeons and Dreamers: The Rise of Computer Game Culture from Geek to Chic. McGraw-Hill/Osborne. ISBN 0-07-222888-1. Retrieved September 25, 2010. Harris, John (July 2, 2009). 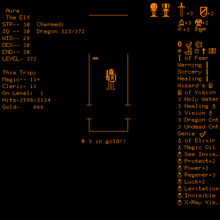 "Game Design Essentials: 20 RPGs". Gamasutra. UBM TechWeb.